Not quite the southernmost tip of India, this island town is separated from the mainland by nearly two kilometres of the Palk Straits. The Pamban bridge, named after the island on which sits the town of Rameshwaram, is a railway bridge, the first sea bridge in India, completed in 1914. It was damaged during the devastating cyclone of 1964 which wiped out the town of Dhanushkodi, a thin strip of land at the southern tip of the island, pointing to Sri Lanka. The bridge was repaired, but Dhanushkodi has remained a ghost town. I once met an old woman, who kept me entertained with her tales of working on the construction of the Pamban bridge, when she was a very young girl and her whole family to worked on the bridge. She had to carry materials on her head while wading through water. She was very proud of her contribution to the only lifeline the island has to the mainland. 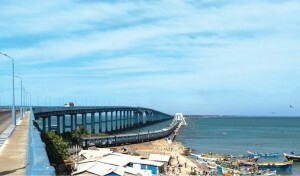 Pamban Island’s mainland connection – rail, road and sea… and the famous connecting bridge. Rameshwaram is a land of legends. Until the road bridge was built in 1988, it remained almost mythical, tucked away in a time zone all its own, not quite connected with the 20th century nor really with the rest of the country. It has always been and continues to be one of the most significant places of pilgrimage, with pilgrims, sadhus and the devout coming from all corners of the country. At every step someone will tell you a tale. And most often it is about Rama and Sita and Lakshmana and Hanuman. While some people will tell you confidently how the Shiva linga in the famous Rameshwaram temple is supposed to have been installed by Rama, who wanted to have the blessings of Lord Siva before going to conquer Lanka, others will recount, equally confidently, how Rama put down the linga after returning victorious from Lanka, in order to pray to Lord Siva for atonement for having killed the Brahmin Ravana Brahmahatya. This story goes on to say that Rama wanted a very special linga and Hanuman was despatched to find it from the Himalayas; but Sita, as she waited for this perfect linga to appear, built one of sand with her own hands and, the story says, it is this linga around which the temple was built. You will be taken to places where they stayed, to the pond in which she bathed and where she worshipped, and as you hear these tales, the whole island comes alive and you feel as if you had stepped into the lives and times of Rama and Sita. This was the last stop of Rama and his army as they advanced to lay siege to and conquer the kingdom of Ravana, Lanka, and bring Sita back. Devotees say you can still see the stones of the bridge laid by Rama’s loyal vanarasena led by Hanuman. If you are standing at the tip of this island, Talaimannar in Sri Lanka is just 29 kilometres away. In Dhanushkodi, the local fishermen are ready to take you for a boat ride to experience the mystic merging of the Bay of Bengal with the Indian Ocean. They say you can see, at the spot where they merge, a patch of water of a totally different hue from that of the waters of either the Bay of Bengal or the Indian Ocean. The moment you cross the bridge and enter the island of Pamban, you enter a completely different landscape than that of the mainland. The shores of the island are dotted with fishing boats and, nearby, are the fishing hamlets. The boats come in all sizes from fairly good sized trawlers to simple catamaran-type artisanal fishing boats. And there is sand everywhere. First it is just sandy beaches, then come the dunes, with their thorny scrub bushes and almost till you reach the town of Ramesh­waram this slightly desolate landscape continues. The wind blows the sand steadily through the open train windows. The huts of the little villages along the way, with the two-or three-storeyed school with its small courtyard that is ever present in our rural landscape, pass by quickly and all of a sudden you are at the bustling Rameshwa­ram station, people waiting for their trains, and the arriving trains emptying out a mass of humanity, all eager to visit one of India’s holiest places. To the devout Hindu, Ra­mes­h­waram is the Kashi of the south. On par with Vara­nasi, it is one of the four most holy pilgrim centres in India, once amongst the Char Dham pilgri­mage sites as defined by Adi Shankara. Rame­sh­­waram is the southern point, with Badrinath in the Himalayas in the north, Puri in Odisha in the east, and Dwarka in Gujarat in the west. Rameshwaram is the only Saiva site among them, the other three being Vaishnava sites. 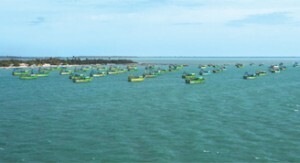 Rameshwaram is also one of the twelve jotirlinga’s across the country. It is believed that Lord Siva manifested in each of these twelve lingas, in the form of a fiery column of light. The town is built around the Ramanathaswami Temple. The temple is mentioned as one of the 275 temples that are revered as the greatest Shiva temples in the country, in the verses of the Saiva Nayanars, the 7th Century Saiva poet saints. The temple, in more or less its current structure, was built by the Pandya Dynasty during the 12th Century. As Rameshwa­ram came under many rulers over the next several centuries, each of them made his contribution, giving to the temple the particular touch of their period. The Chola King, Rajendra Chola had control over the town for a short time. The Jaffna kingdom had close ties with Rameshwaram and was considered its custodian. In the early l5th Century it was part of the Pandya kingdom, and even came under the rule of the Vija­ya­nagara empire. The Sethu­pa­­this, a breakaway from the Madu­­rai Nayaks, finally took control of the island as part of their kingdom of Ramanatha­puram during the 17th Century and took a personal interest in the temple, an interest that continues right up to the present. It is they who largely gave shape to the temple as it is today. The inner shrine is surrounded by three corridors, the inner corridor, the second corridor, and the outer corridor, which is the longest covered corridor in the world. 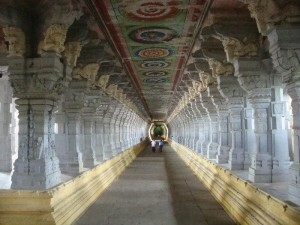 According to the official website of the temple, the total length of this corridor is 2l69 feet (616 m), and it has a height of 22 feet and 7.5 inches (about 7m). It has 1212 pillars in all and is quite something to behold. The second corridor was made of limestone and was closed to visitors for years as it was literally crumbling and falling apart. Repair work was taken up during 1961-1985 to replace the limestone pillars with intricately carved granite ones, but due to lack of funds, the work is only partially completed. Efforts are now being made to complete the work. The fishing boats of Dhanushkodi, which, together with others, keep fishing in the Palk Bay in troubled waters. During the 1970s, I spent many a fascinating moment watching the master sculptors painstakingly and lovingly work with their hammers and chisels on the large granite pillars. The Shilpashastra master was always nearby with his well-worn book, ensuring that all the work was being done according to ancient guidelines laid out in that volume. All the measurements had to be exact. There were still a few such master craftsmen around then and they took great pride in their work. For them it was not work, but a form of worship, as one of them explained to me. Before the road bridge was made, local transport on the island was the jhatka, the one-horse car that took people around when it was not convenient to walk. They created their own special atmosphere, and were one more thing in Rameshwaram that took you back in time. A visit, on foot or with a jhatka, without which a stay on the island remained incomplete, was to the Gandha­madana Parvat. About 3 kilo­metres from the main temple and the town, it is a little hill looking over a vast expanse of the island, dunes on all sides, and the sea on the far horizon. This used to be a relatively uninhabited part of the island, with only its famous thorn trees lining the paved road. Over the years, the huts have been replaced by pukka buildings, with even a makeshift movie theatre blasting out songs. The peace and quiet of this special place is fast disappearing and along with so-called ‘progress’, ever-present inorganic waste is making life difficult in the town. But the charm of Gandhamadana at sunset remains unparalleled. Once you are out of habitation, all you feel is the cool evening breeze, gently sweeping from the sea, and all you hear is the sound of your footsteps. Let us not at this point be disturbed by the honk of the autorickshaw which has now almost completely replaced the jhatka. After a stop at the Hanuman temple at the base of the hill, with its gorgeous orange red Hanuman, and the tasty boiled green gram, handed out by the young dedicated priest as Hanuman’s prasad, you walk up the last stretch of the hill. The path is lined by an ancient temple tank and by some very old and dilapidated structures, taking you even further back in time. At the base of the stairs leading up to the Gandha­madana temple, you are often greeted by the tender coconut vendor’s wizened old face with sparkling eyes and a ready smile on his lips. The temple is known especially for the impression of Rama’s foot print, and pilgrims flock here after a visit to the Ramanathaswamy temple in town. The place is alive with other legends too, of yogis who come here to do their tapasya and of siddhas who passed this way. One such story I have heard is of a young siddha who came from faraway lands sometime in the 19th Century. His fame was great and everyone went to the temple where he was said to be, to catch a glimpse of him. A young priest, unaware of all the excitement, was quietly doing his work at Gandhmadana temple above on the hill, when he suddenly saw, on the top of the temple, in a locked room, with no walls, only bars, a yogi sitting in padmasana, in deep meditation. Bewildered as to how anyone could have entered the room without breaking the lock, he was even more astonished when he noticed that the man was not sitting on the floor but hovering above it in levitation. As he ran out of the temple and down the hill towards the town to alert the townsfolk of this great wonder, he saw a crowd of people coming up the hill from the Ramanathaswamy temple. They told him about the wonderful man they had just seen there was now on his way up the hill to Gandhmadana: it was the same man that the young priest had seen in deep meditation. The story goes that this great siddha spent some time in Rameshwaram, and imparted knowledge to those drawn to such matters, and then suddenly one day, as mysteriously as he had appeared, disappeared. This too is Rameshwa­ram. The pilgrims who come to Rameshwaram are from all over India, young and old, rich and poor, highly educated and completely uneducated. And along with the pilgrims come the sadhus. They come from various orders, some staying for long periods, while others just make a regular stop on their way to other pilgrimage centres. It was always fascinating to see them. They generally kept to themselves, had special places designated for them to stay, and only on special festive occasions did you see them mingling with the other pilgrims. One such occasions was the Maha Shivaratri festival which generally falls in March. It is always a tremendous celebration that goes on for days. Every night, one of the temple deities is taken around the temple in procession, riding in a chariot and mounted on his or her particular vahana. Preceding the procession would be the musicians, the nadaswaram players, and the drummers. At the end of the procession, late into the night, there would be wonderful music concerts, with great musicians from all over South India performing for the people of and visitors to Rameshwaram. I have heard some of the finest Carnatic masters here, be it the veenai or the violin, or vocal. All these festivities lead up to the final night of Shivaratri, where everyone gather on the inner corridor of the temple which surrounds the inner sanctum and is lined with multitudes of Siva lingas. It seemed that anyone could just install themselves in front of one of these and start a pooja that would go on well past midnight. It is probably the only time in the year when the temple remains open almost all night long. An interesting fact about Rameshwaram is that the priests who do the pooja in the temple are from Maharashtra. One version as to why this is so says that some 400 years ago the king of Kandy (Ceylon), who had commissioned the inner sanctum of the temple, brought 512 families of Karmakand Brahmins who were well versed in the recitation of the Vedas to Ramesh­waram. 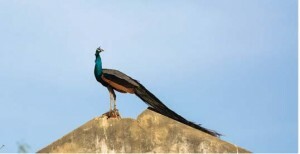 Others hold the Raja of Ramnad responsible for bringing these families from Maha­rash­tra sometime in the 17th Century. But the fact remains, that they have been there for generations and are there still today. They are fluent in Marathi and Tamil but the younger generation have forgotten the Marathi language even though they carry on many of the customs. I was also told that a similar tradition exists in Badrinath where the priests are Brahmins from Tamil Nadu. This could well have been inspired by Adi Shankara, who travelled the length and breadth of India, back in the 8th Century, sowing the seeds of national integration which continue to sprout and grow. Yes, Rameshwaram is truly a place where all of India comes together. It is no surprise then that India’s most loved President, APJ Abdul Kalam, hailed from this land of legends. In the quiet of the early morning, pilgrims are at the beach taking a holy dip in the clear shallow waters and greeting the sunrise with the Gayatri mantra. The outside world is left behind in this moment of an inner communion with something far beyond, or deep within. (Courtesy: Sri Auro­bindo’s Action).